South Indian brides are a treat to look at on their wedding day as they adorn heavily embroidered silk or kanjeevaram sarees along with traditional temple gold jewelry pieces. With so much attention being paid in selecting clothes and jewelry for the big day, the bride’s hair too is distinctly styled to match with her attire. 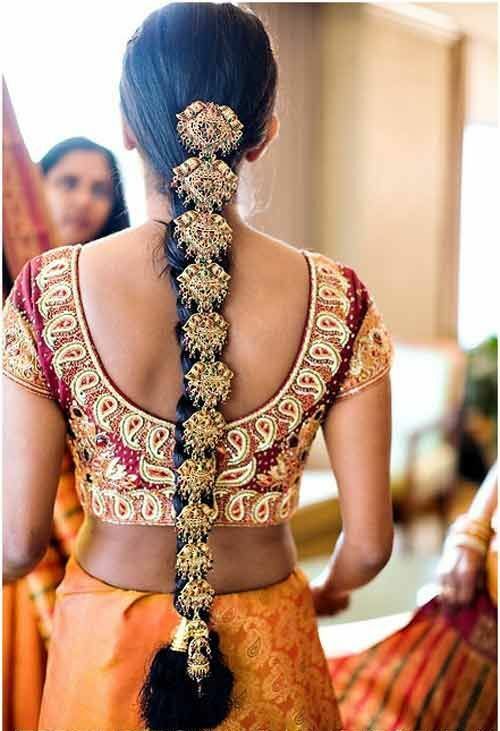 Blessed with long and lustrous hair, South Indian brides can do so much with their hair on their wedding day. On many occasions such as festivals and family functions, they decorate the hair with flowers also known as Poola Jada. This immensely popular style hasn’t lost its popularity since decades and many brides prefer to decorate their hair this way even today. One can find many Bollywood actresses flaunting this style like Hema Malini, Rekha, Sri Devi, Shilpa Shetty, Amrita Rao and Genelia D’Souza. These floral designs are either intricately woven on the long hair plait or attached on a cardboard design and then stitched on the plait. Billai: Nine circular hair clips used to decorate the braid. Naga Jadai: This long gold piece of temple jewelry has engravings of Lord Krishna dancing on the head of Kaliya. Chandrasuryan: Another type of temple jewelry, it comprise of 2 pieces depicting Surya and Chandran. They are worn on the head on both sides of the head. 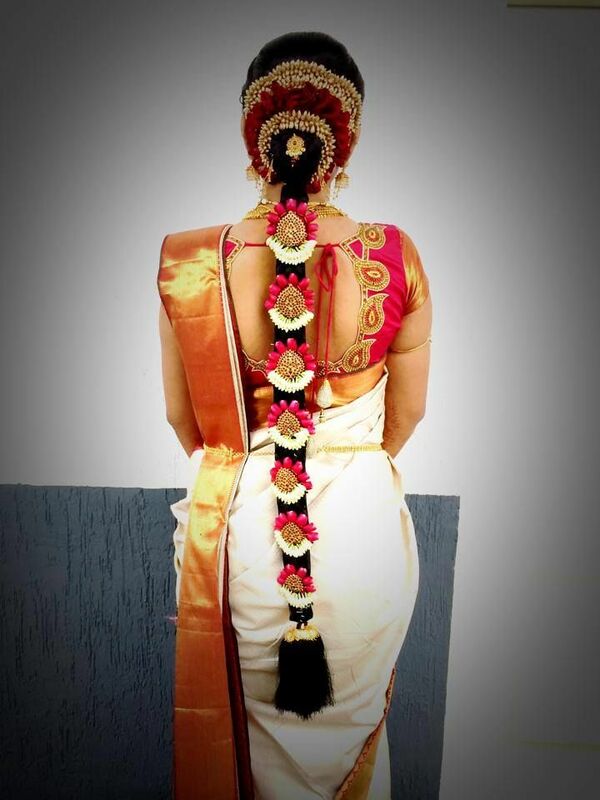 Thalaisaamaan: This headpiece is worn on the center parting and on both sides of the head. Chotlis: Modern day brides opt for this jewelry and wear it on the braid. It comes in a variety of stones and colors. These styles will make your tresses look absolutely glamorous! Hairstylists are really creative these days, hence brides can discuss in advance if they want to try something entirely new or stick with the already popular and traditional designs.